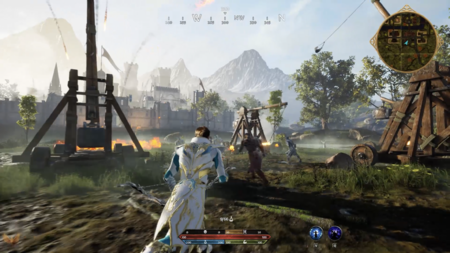 Ashes of Creation Apocalypse battle royale map. Image credit: The Ashes Post. The world of Verra features an in-game viewable world map. This map is not randomly generated, and begins covered in a fog of war. 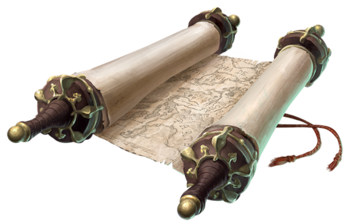 Players will not be able to see the world until they have explored it or gathered information about it. The world is also full of imperfect information, which will require the player to act on it for verification. For example, you may hear a rumor in a tavern that tells you the location of a cave full of weak Kobolds, but this was not accurate as the rumor was started by well-equipped bandits in order to waylay overconfident adventurers. When information is gathered, or the player has successfully explored an area, points of interest are marked on the map. These points of interest are determined by Node progression; and not every server will share the same map, as player decisions will vary server to server. 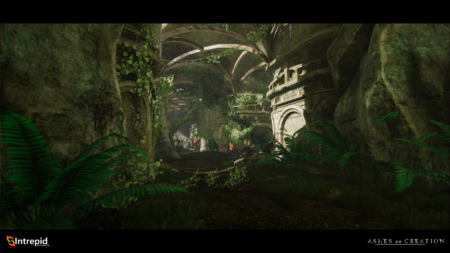 In addition to node progression being a factor on map generation, zones in Ashes of Creation will cater to all levels. 480 km2 (square kilometers) is the approximate world size at launch. An additional 100 km2 may be taken up by the Underrealm. 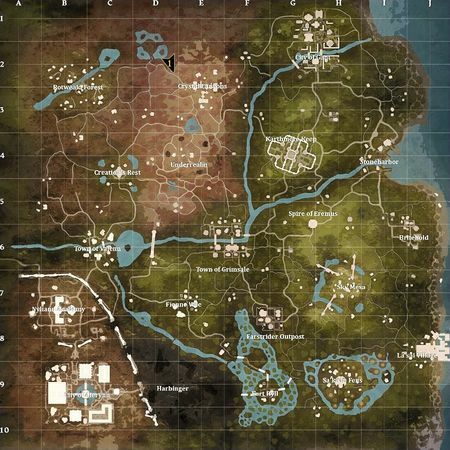 It is anticipated that a mounted player can traverse the entire map in a matter of hours. The Alpha-0 map is a 4km x 4km area (16 km2). The Ashes of Creation Apocalypse battlegrounds map is 2.5km x 2.5km2 (6.25 km2). The Alpha-1 map is 120 km2. There will be 103 node locations at launch. Economic regions are static areas defined by geographic points of interest. Castle regions are larger and encompass multiple economic regions. Nodes are the glue that hold castle and economic regions together in potential synergy or chaos. Node ZOIs are fluid and change their area based on the progression of the node and its neighbors. 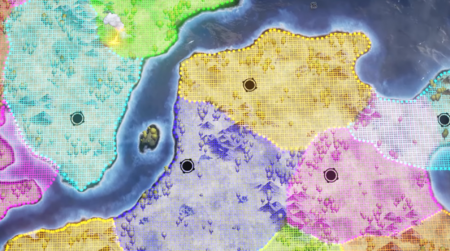 Castle regions, Economic regions, and Node ZOI (Zones of Influence) can overlap. Castles have direct power over the Nodes that belong to it, but also have soft power across the entire region it belongs to. All Nodes belonging to that region pay fealty to the Castle in the form of taxes paid directly to the Castle. The Monarch sets the rate, and can use those proceeds to upgrade defenses, maintain the Castle’s direct Nodes, or provide buffs and benefits to the citizens of that region, as the magnanimous ruler that you are. Guild castles influence a castle region around them. A castle's region is 1/5th the game world. A castle could have a metropolis beside it. Castle region boundaries are static. Guild castles impose a tax on all revenue for the nodes within its region. In addition to taxes, Castles also influence crop yields, resources and events within its region. Part of the tax and resources gathered are applied to the castle for improvements. The remainder of tax income can be used by the guild for whatever they want. 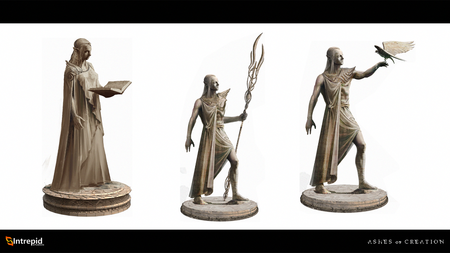 200 foot tall Pyrian statues in Alpha-1. Landmarks are scattered throughout the world, allowing players to judge their position on the map. Verra will not be randomly generated, but the starting resource points may be different on each server. Battle maps allow players to strategize, gain bonuses on planned attacks, and see the blueprints of attackable points. Whether attacking a node or castle, players will be able to discern defenses, analyze possible weak points and gain tactical advantages before the battle begins. Battle maps might not fit into lower level or smaller sized taverns. Battle maps are not currently on the official roadmap for launch. Battle maps offer an interactive command map instead of the standard World map. The system would be accessed through City hall or battle planning center. 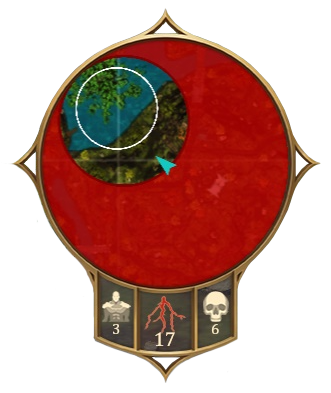 Battle maps work similar to a Risk board, with the node siege map laid out with moveable pieces that would represent defenses. Moving pieces would create buff zones that would give active siege players access to special items or perks. The map does not show the currently active battle: pieces will have to be moved before the battle commences. The idea is to make sieges more strategic and avoid simple zerg tactics. Pre-alpha Mage finding hidden treasure. Treasure hunting is not exactly "cartography", but it does involve maps that help to pinpoint the location of hidden treasures throughout the world. The more treasure a player finds the better maps they can create. Hints are given through rumor mills, interaction with different NPCs, and gaining access to potential dig sites. Treasure hunting will be a "way of life" rather than a profession. The world will be the same on each server, but Nodes will develop differently. Different servers will have different narratives. Things that happen on one server may not happen on another. Servers will be named after the champions of the great battles that led up to the fall of Verra. There will be a multitude of servers located throughout the various regions of the world. Post launch, users will be able to select their server by the ping or the region that's notated next to the server. 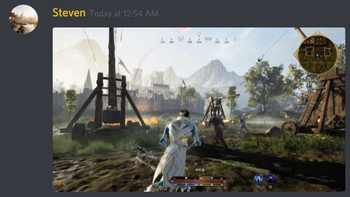 Ashes of Creation Apocalypse server selection is driven by the party leader. Whatever region they have selected will apply to their friends and squad. Nodes are pre-set locations, wrapped in a zone of influence (ZOI). Every node is given purview over a predefined geographic area called a Zone of influence (ZOI). Player activity within the ZOI is weighted and counted toward a particular node’s advancement. 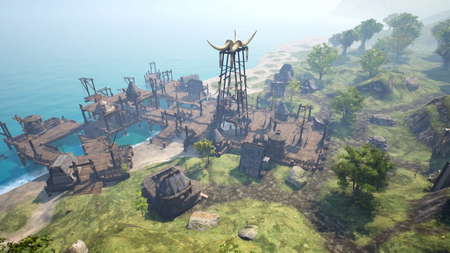 By undertaking familiar activities, such as questing, gathering and raiding, players have agency in determining which nodes in the world will develop. Up to one fifth of the world will be encompassed within the ZOI of a Metropolis. The many vassal nodes within a ZOI's "border" could end up looking like a country or nation. Zones of influence connect fully across the world without any gaps. There will be nodes along the coast and on islands. These nodes will have specific water oriented influences and abilities, services, questlines, that relate to the seas. It may be possible to siege a coastal city by sea. Island chains are part of Ashes of Creation naval content. Some Environments (Biomes) have fixed climates and others are variable. Weather conditions change with the Seasons. There will be dynamic weather that varies in intensity. For example: Drizzle to/from storm, or Blizzard to/from snow. ↑ Interview, 22 May 2017 (22:54). ↑ 2.0 2.1 2.2 2.3 The mighty beard! ↑ 4.0 4.1 Livestream, 15 May 2017 (30:53). ↑ 7.0 7.1 Interview, 17 August 2018 (10:43). ↑ Livestream, 31 October 2017 (24:00). ↑ 12.0 12.1 12.2 Blog - Know Your Nodes - The Basics. ↑ Interview, 24 August 2018 (3:44). ↑ 30.0 30.1 30.2 30.3 30.4 Livestream, 17 November 2017 (18:29). ↑ 31.0 31.1 31.2 31.3 Livestream, 17 August 2018 (10:01). ↑ 36.0 36.1 Livestream, 31 October 2017 (33:28). ↑ Livestream, 18 July 2017 (53:52). ↑ 40.0 40.1 Livestream, 4 May 2018 (39:05). ↑ 41.0 41.1 41.2 Livestream, 6 December 2018 (40:46). ↑ Livestream, 19 May 2017 (37:03). ↑ 44.0 44.1 44.2 44.3 Livestream, 27 September 2018 (48:13). ↑ Interview, 20 April 2018 (7:22). ↑ Interview, 11 May 2018 (55:16). ↑ 49.0 49.1 Livestream, 9 July 2018 (39:32). ↑ 52.0 52.1 Livestream, 8 April 2018 (PM) (1:01:28). ↑ Livestream, 19 May 2017 (37:51). ↑ Video, 30 May 2017 (0:01). ↑ Livestream, 18 July 2017 (36:47). ↑ Livestream, 28 July 2017 (41:25). This page's content was last modified on 16 March 2019, at 22:55.